Olive Cotton is one of the most important and revered figures in the history of 20th century Australian photography. Her highly considered compositions betray an ongoing commitment to the study of light, line and form. Throughout her career, her photographic output was both innovative and broad and straddled pictorialism, modernism and the documentary genre. She possessed an astute sensitivity to detail and could impart a graceful intensity on modest domestic scenes, portraits or fragmentary views taken from the natural landscape. 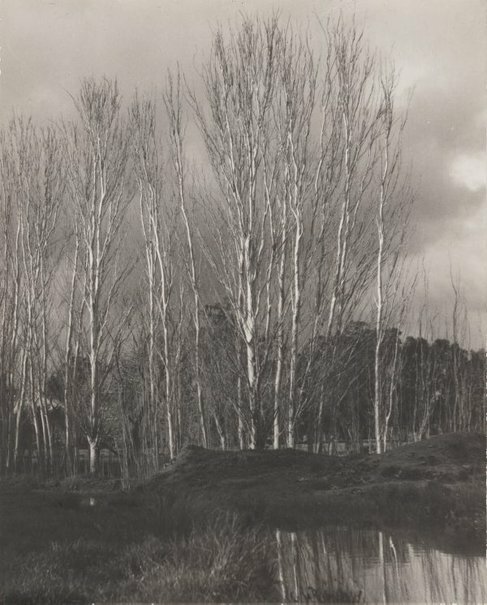 Having studied English and mathematics at the University of Sydney, graduating in 1934, Cotton pursued an interest in photography and began to work in the studio of childhood friend Max Dupain that same year. In addition to her work in the studio, and later when she had established her own career as a commercial photographer, Cotton pursued her own artistic trajectory and established herself as an independent practitioner. These small contact prints reflect Cotton’s sustained interest in the natural environment and her deep connection to the landscape outside Cowra where she spent the second half of her life. Cotton moved to a property called ‘Spring Forest’ in 1951 and lived without running water or electricity. To continue her practice, she set up a studio in Cowra where she continued working as a commercial photographer but also continued to pursue personal work. Her veneration of the landscape is evident in these delicate studies of trees isolated against quietly atmospheric scenery.